Announcement I create my unique, beadwoven jewelry by stitching the smallest Japanese and Czech glass seed beads into intricate mandala patterns with a needle and high quality beading thread. 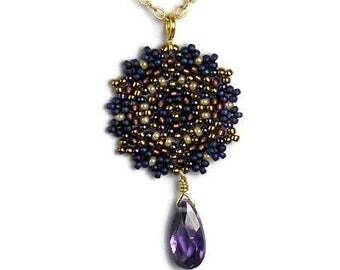 From my palette of literally hundreds of seed bead colors, I individually stitch each bead into intricate designs. Using the finest quality materials, I create styles that are durable, unique, versatile. You'll love wearing them! Each piece is given a woman's name that identifies a specific colorway. Check out the different names and their unique meanings. I'm happy to create jewelry in a custom colorway named after you. I am always working on new designs. Please check back often! 4/7/19 (Sun 9 - 3) San Clemente Village Art Fair; My location is in front of 144 Avenida del Mar, San Clemente. 7/7/19 (Sun 9 - 3) San Clemente Village Art Show; My location is in front of 144 Avenida del Mar, San Clemente. 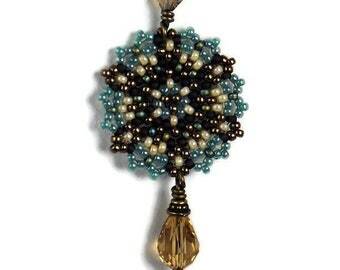 I create my unique, beadwoven jewelry by stitching the smallest Japanese and Czech glass seed beads into intricate mandala patterns with a needle and high quality beading thread. 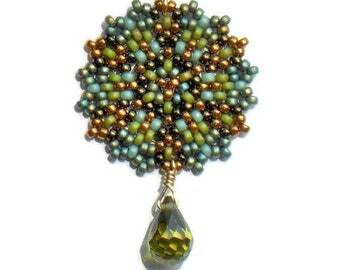 From my palette of literally hundreds of seed bead colors, I individually stitch each bead into intricate designs. Using the finest quality materials, I create styles that are durable, unique, versatile. You'll love wearing them! Perfect as usual - Thank you! Little Muse Designs by Anthe Wosczyna creates intricate bead woven jewelry based on the Mandala. 'Mandala' is Sanskrit for circle, community, connection. A circular design containing concentric geometric forms, it symbolizes the universe, totality or wholeness and the relationship of humans with the cosmos. My interest in intricacy has evolved into individually hand weaving small glass beads, gemstones, natural pearls and Swarovski crystals into richly diversified designs in a multitude of colors. Each piece is handcrafted in my studio at the foot the San Gabriel mountains in Southern California—a beautiful area and the source of inspiration for my designs. I create one of a kind jewelry for you to treasure. Find littlemusedesigns at the following upcoming market! Shop handmade and independent goods from 150+ local makers & food artisans at Patchwork Show in Oakland! FREE to attend & dog friendly! PLUS food artisans + trucks, DIY crafting and music! Patchwork vendors are strategically selected by a jury and feature: - clothing - handbags + accessories - jewelry - art + home goods - ceramics - plush, crochet + knit items - pet gear - craft kits & patterns - apothecary goods SPRING 2019 SHOWS: Santa Ana, California May 26 – Downtown – 2nd @ Sycamore Oakland, California June 1 – Jack London Square – Broadway and Water Street Ventura, california June 9 - Ventura Fairgrounds - 10 West Harbor Blvd. Long Beach, California June 23 – Marine Stadium – Appian Way @ Bayshore *All shows are free to attend and 11-5pm. Welcome to Little Muse Designs! Thank you for visiting my little corner of Etsy. Have fun browsing my shop. If you would like to receive announcements about upcoming shows and new designs, please contact me. I'll keep you in the loop! Rest assured, I never share your information with anyone else. The enjoyment of your Little Muse Designs creation is very important to me. My main goal is to make you happy! I believe that your chances of disappointment are very low if you take a moment to review the pictures and description of each item before purchasing. An easy way to check how a necklace, earring or bracelet will look on you is to cut a length of yarn or string and hold it up to yourself. If you find that an item is not as described or depicted, please contact me within 2 days of receiving your order. Once you have contacted me, your return will be accepted if postmarked within 5 business days of the original delivery date noted on the delivery confirmation. The customer is responsible for the non-refundable cost of return shipment and is urged to insure the package for the purchase price or mail at their own risk. There is a small restocking fee of 5% of the item's value in order to cover non-refundable fees incurred on the transaction. A PayPal refund will be issued to the original purchaser once I assess that the returned item is received in original, unworn/unused condition. If your package is damaged upon delivery, please take a photo before opening, then photograph the contents for insurance purposes. Little Muse Designs accepts credit cards as well as PayPal, a secure online payment system that takes all major credit cards. You don't need a PayPal account when paying by credit card. Simply select 'PayPal' as the payment method and follow the instructions on the PayPal website. I request that payment be made at time of purchase. If payment is not made within 24 hours and you have not contacted me, the transaction will be cancelled and the item relisted. Items cannot ship until payment is received. Your Etsy confirmation of payment is your receipt. You will also receive a payment confirmation email from PayPal or Etsy. If you do not receive this, check to see if you have fully completed the PayPal or credit card portion of your order. All California residents will be charged 8.75% sales tax. I always do my best to ensure that you are happy with your purchase. I would love to have you as a return customer! Feedback is left once the transaction has concluded and I am sure that you are completely satisfied. Although it is not required, your feedback is appreciated. If you have any concerns, please contact me before leaving feedback. If you wish for your purchase to remain private, please inform me that no feedback be left. I am happy to honor your request. Holidays have increased postal traffic. Please allow enough time for shipment during busy times of the year. Need that special item quickly? Rush shipment is available for your in-shop selection. There may be an additional charge for rush orders of custom items. Please contact me for available shipping options and costs prior to purchase. Be sure to provide me with your zip code. Little Muse Designs ships to the address on your Paypal or credit card account. Please verify that this address is correct before finalizing payment. If you prefer a different shipping address for yourself or a gift recipient, please let me know in the 'Note to Seller' section at time of purchase. Your purchase ships in a sturdy gift box inside a USPS Priority Mail cardboard box. When appropriate, multiple items ship in the same gift box in order to conserve packing material and reduce shipping cost. If you would like a separate box for each item, please let me know. I will be happy to accomodate you. Orders within the U.S. are mailed via USPS Priority Mail and include Delivery Confirmation. A confirmation email will be sent by PayPal when your order ships. This email will include your Delivery Confirmation number. Please note that this number is not a step-by-step tracking number and is not updated until your package reaches its destination. If a package with Delivery Confirmation is reported missing but is confirmed received via the tracking number, I cannot issue a refund or replacement. To avoid disappointment, I highly recommend that you insure your package. Please contact me if you would like to upgrade your shipping method and/or add insurance before purchasing your item. Orders over $200 are delivered to you by UPS. Your package will be insured, trackable and will require a recipient's signature. International shoppers, please contact me prior to checkout in order that shipping charges can be calculated and added to your invoice. International orders under $100 are sent via USPS First Class International/Airmail. This is the most economical shipment method but it does not provide insurance or tracking of your package. Little Muse Designs cannot be held responsible for lost or damaged packages that are sent by USPS First Class International. Please contact me if you would like to upgrade your shipment method to Priority Mail/Registered, Express Mail, Global Express Guaranteed or include insurance. International orders over $100 are delivered by UPS. Please contact me for specific shipping rates to your country. I am required by federal law to state the value of an item on the customs form. Please do not request that the package be shipped as a gift as it would be illegal to do so. Custom orders can be created from any of the designs in my shop or 'sold' section. If you prefer a design with a different metal (including 14k gold), necklace length or need a matching set (wonderful for brides and bridesmaids, holiday gifts and other special occasions), please contact me. Sensitive ears? I offer hypoallergenic niobium earwires (in choice of antique copper and oxidized silver colors) as well as 14k gold. Ears not pierced? Not to worry. A clip-on style is available. Once we agree on a design, its cost and completion time, I will make a reserved listing for your custom order. Little Muse Designs requires 100% payment prior to creating custom orders. Please note that custom orders are not returnable/refundable. Packaging is simple, attractive and suitable for gift-giving. A complimentary, beautifully handwritten gift card can be included with your selection to the lucky recipient. Just let me know in the 'Notes to Seller' section at time of purchase that your item is a gift and provide me with your message. Also include the gift recipient's mailing address. Little Muse Designs offers wholesale terms to select retailers. Please contact me for details. My jewelry is carefully photographed to ensure that you see the intricate detail and attention given to each piece. As a result, objects may appear larger in photos than they are in person. Colors may also vary with individual monitors. Please take a moment to read the descriptions and measurements as noted in the listings. If you have any questions concerning an item, kindly contact me prior to purchase. Selected pieces worn by the models in my photos are from their personal collection. I just want to show you how lovely a piece can look on you! My creations are hand-crafted from the highest quality materials. Please use care when handling and storing your jewelry. By avoiding exposure to perfumes, water, cosmetics and hairspray, your delicate treasures will provide lasting enjoyment. You can maintain your jewelry's shine by wearing it often and storing it in an air-tight plastic bag. Gently buffing the metal with a jeweler's polishing cloth can also restore its shine. Oxidized sterling silver and antique brass should be left to develop a mellow patina. Little Muse Designs jewelry is not to be resold, unless you have an established wholesale account with me. Images and text are not to be used for commercial purposes without my permission. All designs, images and content ©2008-2019 Little Muse Designs. All rights reserved.